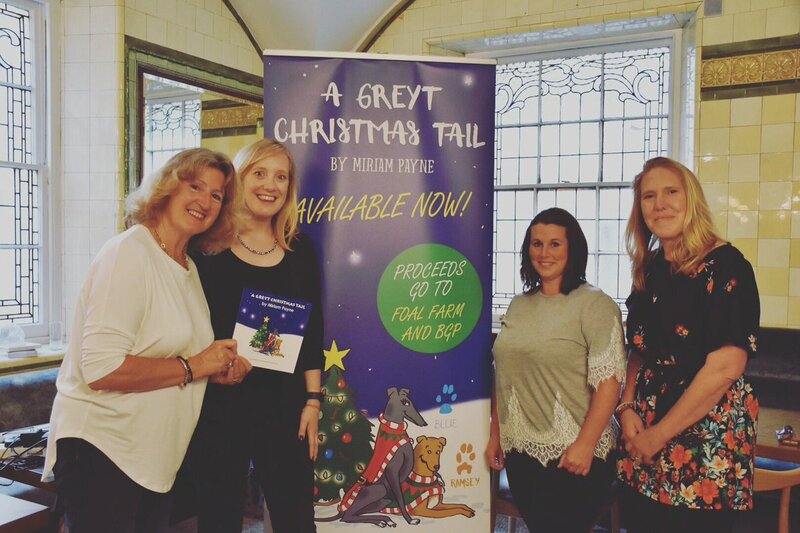 Congratulations to Miriam Payne, who launched her first book A Greyt Christmas Tail on Tuesday 25th July 2017, at the Institute of Directors, London at the AuthorCraft event. Congratulations also goes to her dogs, Ramsey and Blue, the canine stars of the book! A Greyt Christmas Tail tells a story of friendship and adventure, set on Christmas Eve. When Santa’s sleigh crashes in their back garden on Christmas Eve, rescue dogs Ramsey and Blue jump into action. Volunteering to pull the sleigh, they help Santa meet his deadline and deliver presents around the world – all before their hoomans wake up. This book is an accessible, colourful tale of two best friends, perfect for children but with a hidden message. The book has been beautifully illustrated by Anne-Marie Sonneveld. Ramsey is a 5-year-old lurcher who was abandoned as a puppy. He was found by Foal Farm Animal Rescue and bounced into Miriam’s life when she adopted him at the age of 7 months. Blue is a 7-year-old ex-racing greyhound. She was adopted from her owner/trainer when she retired from racing aged 4. Since adopting Ramsey and Blue, Miriam has become more aware of the growing crisis of abandoned dogs, overcrowded rescues and abuse of greyhounds discarded by the racing industry here in the UK. Blue was lucky – she had a great owner who loved his dogs and ensured they all found homes after racing but too many others are not so lucky. Greyhounds are classified as livestock rather than pets so this book aims to change their perception in the eyes of the next generation. Proceeds from A Greyt Christmas Tail are being donated to Foal Farm Animal Rescue and Birmingham Greyhound Protection. Miriam Payne worked as a journalist for 16 years, both in the USA and here in the UK. Whether on camera as a reporter or behind the scenes as a producer or news editor, Miriam has always enjoyed writing and knows how to tell a good story. She won an Emmy Award in 2015 with NBC News for their coverage of the downing of MH flight 17. She currently lives near Wigan, with her husband and two dogs, Ramsey and Blue. Foal Farm Animal Rescue was founded in 1960 and aims to take in as many sick, distressed and unwanted animals as possible, restore them to health and happiness, find them good homes or provide sanctuary for life. No healthy animal is ever destroyed and, if no home can be found, the animal becomes a resident for the rest of its life. Foal Farm relies entirely on voluntary contributions. Birmingham Greyhound Protection was set up in 2012. Founder Kerry Elliman works tirelessly to help those greyhounds who are not lucky enough to be put into mainstream rescues. Since 2012, BGP has rehomed over 700 greyhounds. In 2017 Kerry set up a sister rescue in China, Candy Cane Rescue, to help greyhounds who are being found in the meat trade and, after discovering UK and Irish trainers were exporting greyhounds to Asia and Pakistan, where many suffer unimaginable cruelty, campaigns for a ban on exports to countries with no animal welfare. 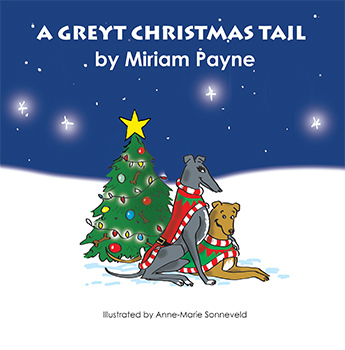 A Greyt Christmas Tail is 36 pages long and costs £9.99. It is available to buy from Amazon, to order in all good book shops, and the Filament bookshop, as well as Miriam’s website (when ordering direct from the author, orders will include a free digital download). Are you using the Author App?